92 | BROADBAND COMMUNITIES | www.broadbandcommunities.com | NOVEMBER/DECEMBER 2017 BROADBAND APPLICATIONS Building Fiber to Schools Here's a good-news story: The drive to provide high-quality internet service to U.S. schools has made tremendous progress, and the goal of universal connectivity is within sight. 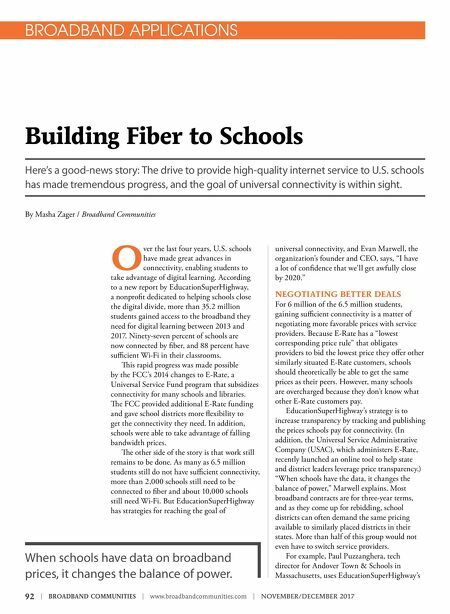 By Masha Zager / Broadband Communities O ver the last four years, U.S. schools have made great advances in connectivity, enabling students to take advantage of digital learning. According to a new report by EducationSuperHighway, a nonprofit dedicated to helping schools close the digital divide, more than 35.2 million students gained access to the broadband they need for digital learning between 2013 and 2017. Ninety-seven percent of schools are now connected by fiber, and 88 percent have sufficient Wi-Fi in their classrooms. is rapid progress was made possible by the FCC's 2014 changes to E-Rate, a Universal Service Fund program that subsidizes connectivity for many schools and libraries. e FCC provided additional E-Rate funding and gave school districts more flexibility to get the connectivity they need. In addition, schools were able to take advantage of falling bandwidth prices. e other side of the story is that work still remains to be done. As many as 6.5 million students still do not have sufficient connectivity, more than 2,000 schools still need to be connected to fiber and about 10,000 schools still need Wi-Fi. But EducationSuperHighway has strategies for reaching the goal of universal connectivity, and Evan Marwell, the organization's founder and CEO, says, "I have a lot of confidence that we'll get awfully close by 2020." NEGOTIATING BETTER DEALS For 6 million of the 6.5 million students, gaining sufficient connectivity is a matter of negotiating more favorable prices with service providers. Because E-Rate has a "lowest corresponding price rule" that obligates providers to bid the lowest price they offer other similarly situated E-Rate customers, schools should theoretically be able to get the same prices as their peers. However, many schools are overcharged because they don't know what other E-Rate customers pay. EducationSuperHighway's strategy is to increase transparency by tracking and publishing the prices schools pay for connectivity. (In addition, the Universal Service Administrative Company (USAC), which administers E-Rate, recently launched an online tool to help state and district leaders leverage price transparency.) "When schools have the data, it changes the balance of power," Marwell explains. Most broadband contracts are for three-year terms, and as they come up for rebidding, school districts can often demand the same pricing available to similarly placed districts in their states. More than half of this group would not even have to switch service providers. For example, Paul Puzzanghera, tech director for Andover Town & Schools in Massachusetts, uses EducationSuperHighway's When schools have data on broadband prices, it changes the balance of power.